In his first Western Australian residency, Indonesian installation artist Mulyana delights with a playful yet thought-provoking sea-themed installation “A Man, A Monster & the Sea”, at FORM’S Goods Shed exhibition space. 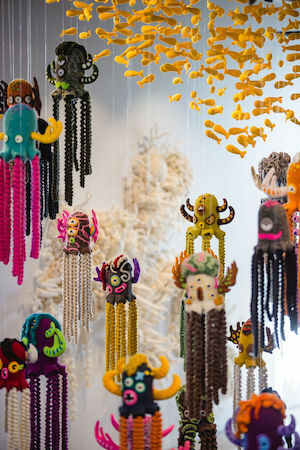 Using yarn – a medium traditionally associated with accessories such as scarves, throws and blankets – Mulyana‘s soft and dynamic knitted and crocheted sculptures of reef, coral and marine creatures not only subvert our expectations but reference the threat that climate change poses to underwater worlds. Mulyana’s grouped installations are ambitious in scale; each installation piece is its own standalone feature occupying the floor, wall or air-space. In combination with the intricate detailing that cleverly mimics coral, the works evoke a sense of wonder. Schools of fish and jellyfish ‘float’ in the air. Photo: Taryn Hays, courtesy of FORM. First, we encounter the safe world, where Mulyana’s alter-ego, a monster named Mogus, takes refuge. The colourful coral reef in Mogus World IV is teeming with life and vitality. It reaches, sprawls and cascades. Hung from the ceiling to “float”, the resulting movement of the schools of fish and jellyfish mimics the undulation of water. This exhibition is not a static experience; for children and adults alike, the installations invite exploration from different vantage points. 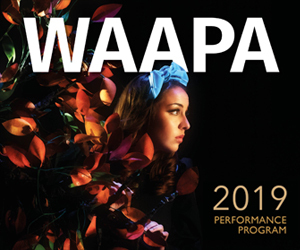 Though touching the works is discouraged, there is an interactive family-friendly activity in the exhibition which encourages participants to use props to play and imagine. A sobering reality in ‘Satu’. Photo: Taryn Hays, courtesy of FORM. Though the googly-eyed creatures of Mogus World (as Mulyana describes his imagined marine environment) are cute and cartoonish, the narrative of the exhibition is grounded in sobering reality; environmental disaster is not the stuff of fairy tales. 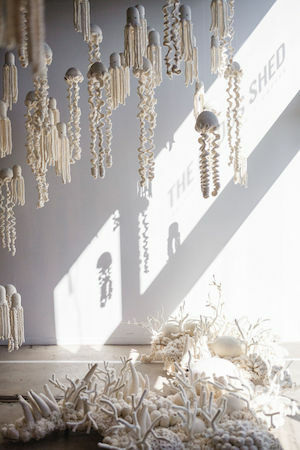 As the Satu installation reminds us, coral turns white when it starts to die. The vivacity of Mogus World IV starkly contrasts the stretch of bleached jellyfish, whose tentacles dangle eerily towards the skeleton-like coral below. The fish are gone, the jellyfish are drifting away from the coral, leading to Si Hideung, who stands as a warrior evolution of Mogus. He is now on the defensive, in armour woven from a foreign material; plastic rope. The messages seem clear: it is plastic that is starves and destroys marine life. The final installation, Kosong, is constructed in monochromatic dark tones. Mulyana explains that “while blackness may appear to be a symbol of emptiness, it also provides space in which to pause and begin a new journey”. So, though the word “kosong” means empty, the work speaks to renewal; the end of one cycle leads to another. This cyclical nature is depicted in the tilted ring of numerous black jellyfish suspended above the greyed coral like a halo askew. The effect is ethereal; highlighting, perhaps, the fragility of these precious and unique underwater environments. Mulyana originally learnt how to knit and crochet at the Tobucil collective in Bandung. Now based in Yogyakarta – aka Jogja, a city well known for its contemporary art – his collaborative community-based projects see him training and working with a group of women known as Konco Mogus. He and his “Mogus family” work to co-create these vivid, intricate clusters of sea-life. It’s this spirit of connection that embodies how we should interact with each other and our surroundings if we’re to realise conservation efforts. An exhibition for all ages, “A Man, A Monster & the Sea” is worth diving into. “A Man, A Monster & the Sea” shows at FORM Claremont, Goods Shed until the end of May. Pictured top is ‘Mogus World IV’ in which intricate detailing cleverly mimics coral. Photograph by Taryn Hays, courtesy of FORM.